Cosmetic Acupuncture is for the person who wants to turn the clock back, look his or her best, feel revitalized, and enjoy it all with good health and a healthy sense of well-being. Some of the effects reported by people undergoing cosmetic acupuncture are firmer skin and jaw line, reduced and softened wrinkles, vibrant and more even skin tone, reduced or eliminated acne and rosacea, increased energy and sense of well being, reduced or eliminated hot flashes, improved digestion, reduction or elimination of insomnia. In 2005, 11.5 million surgical and non-surgical procedures were performed. This is a 444% increase since 1997-119% in surgical procedures and 796% in non-surgical procedures. Botox injections were the most common non-surgical procedure done in 2005,at nearly 3.3 million procedures - 2 million of those for women. Total expenditures came to US$8.2 billion for surgical and US$4.2 billion for non-surgical procedures. Prior to practicing traditional Chinese medicine, I worked for 20 years for several fine plastic surgeons. I am intimately familiar with the world of cosmetic enhancement. Over the past decade, I have seen a marked increase in the number of people choosing to have cosmetic surgery, and choosing to do so more often than ever before. As baby boomers age and credit cards proliferate, there has been a huge surge in the demand for these services. At the same time, there is a need for less recovery time, less risk, and less expense. We are a society that does not believe in delayed gratification. At its extreme, this reliance upon cosmetic surgery can become a problem. In my experience, I have seen firsthand the loss of what I call a person�s facial �blueprint�. This is referred to in the medical community as body dysmorphic disorder (or syndrome), a condition that affects 7 percent to 15 percent of Americans. My experience in plastic surgery practices along with my interest in aesthetics made me receptive to the concept of cosmetic acupuncture when I was in school. What I expected and what I experienced made for an amazing journey. It has given me a deeper understanding of what truly creates beauty, in part by helping patients come to an understanding of their innate beauty. I have come to understand that cosmetic acupuncture can be a very important therapeutic tool for �giving you the gift of you�. When consulting with a new patient about cosmetic acupuncture, I first tell them the "Bad" news: Cosmetic acupuncture is not a facelift. Then I share the good news: Cosmetic acupuncture is not a Face Lift. One of the many pluses of cosmetic acupuncture (besides the healthy side effects) is that it leaves you with no scars, rearranged tissue, or other potentially undesired side effects. However, cosmetic acupuncture may not be as dramatic as you would like. It is unable to hold your skin in place if you don�t take care of yourself. A significant illness or stressful period in your life will most likely shorten the effects of cosmetic acupuncture because your health is always reflected in your skin. However, the cosmetic acupuncture protocol can repeated following an illness or stressful event. It can also be performed periodically to help maintain the results. Cosmetic Acupuncture is much more than skin deep. It is a commitment to one�s lifestyle and health, ideal for the person who wants more than just an effort at looking like his or her 20- or 30-year-old daughter. It is for the person who understands that showing up for oneself and creating a healthy lifestyle will result in a better quality of life over a longer period of time, a quality of life over a longer period of time, a quality of life that will reflect in one's inner and outer beauty. That's not to say that there are no risks, however. The most significant risk is bruising and, depending on the cosmetic acupuncture system used, there is a very slight risk of numbness or nerve damage. Cosmetic acupuncture is a type of therapy used along with a TCM practitioners� diagnosis and differentiation to emphasize the anti-aging properties of Chinese medicine. The system I co-created and teach instructs the practitioner in facial diagnosis, both from psychological and physiological standpoints. The analysis of skin structure, both from an Eastern and Western perspective, is included in this system, along with food choices containing the nutrients that support skin health. The energetic properties of food are figured into the patient�s treatment plan based on what is found during the facial diagnosis, along with other diagnostic tools the practitioner normally uses. A specific protocol and needling technique, geared towards cosmetic effect, is taught to the practitioner to compliment the body treatment that balances the patient�s energy. Besides creating balanced energy within the patient, these protocols are believed to be effective because the needling causes micro-traumas that stimulate fibroblasts (the cells that form collagen and elastin fibers). The expected longevity of the procedure is enhanced by the patient�s lifestyle and diet. The Journal of Clinical Acupuncture reported in 1996 that the effects could be expected to last 3-5 years. Are you prepared for the upkeep and the change in your tissue structure? How might this surgery or introduction of a foreign substance affect your health? In the event you do not heal well or have the unfortunate luck to connect with a sub-par surgeon, you cannot put a blouse over your face. Though occurrences of negative side effects from surgery or other more-invasive cosmetic procedures are rare, they are life-changing if they happen to you. Cosmetic acupuncture is NOT surgery. Cosmetic acupuncture cannot correct a deviated septum or reshape a nose. It cannot lift eyelid skin that droops and blocks vision. It cannot perform breast reduction - a wonderful procedure that can eliminate neck pain, back problems and low self-esteem. Cosmetic acupuncture cannot eliminate a panniculus (abdominal apron) left from losing a significant amount of weight, another cause of back problems (due to the weight of the apron) as well as skin problems. Cosmetic acupuncture does, however, embody the quintessential anti-aging aspects of traditional Chinese medicine. When considering cosmetic acupuncture, it is important to meet with an acupuncturist well versed in plastic surgery and cosmetic procedures who is willing to discuss the benefits and risks, as well as long-term effects and goals. Then the patient can make an informed decision. Visit Acufinder.com to view a directory of acupuncturists in your area. Denise Ellinger, L.Ac. is the Co-Creator of the Mei Zen Cosmetic Acupuncture System and an NCCAOM-certified instructor of Cosmetic Acupuncture. Prior to studying Traditional Chinese Medicine, Denise worked in the field of plastic surgery for twenty years and studied interior design. 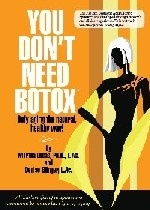 She is co-author of You Don't Need Botox! Defy Aging the Natural Healthy Way.